"It's in the Cards," an interactive, expanding art display at the Robert W. Woodruff Library, features old library catalog cards turned into art and poetry. Pick up a card to decorate at home, then return it to add to the exhibit. Summer is winding down, but there are still lots of entertaining events and educational opportunities to enjoy as you get ready for students to return to campus later this month. 1. Get to know "Spider Woman," then dive into "The Waters and the Wild." No, not the Marvel Comics superhero. Spider Woman is an important figure in Native North American mythology, often associated with the creation of the earth. Learn more by visiting "Spider Woman to Horned Serpent: Creation and Creativity in Native North American Art," currently on display at the Michael C. Carlos Museum. Starting Aug. 22, you can also visit the Carlos to dive into "The Waters and the Wild: Alen MacWeeney Photographs of Ireland," inspired by the poetry of W.B. Yeats. The Carlos Museum offers free admission for Emory faculty, staff and students. 2. Pop in for "Pop Up Wednesday" at Emory Point. On Wednesday between 11 a.m. and 2 p.m., Emory Point offers a free interactive experience on the patio between Tin Lizzy's and Marlow's Tavern. The summer "Pop Up Wednesdays" series concludes Aug. 5 with a cookie decorating party; practice your skills and enter a giveaway for The General Muir. Located on Clifton Road, Emory Point is a mixed-use development created in partnership between Emory University, Cousins Properties and Gables Residential. 3. Celebrate the legacy of Irish poet Seamus Heaney. If you missed "Seamus Heaney: The Music of What Happens," the immensely popular exhibition about the late Irish poet held at Emory's Robert W. Woodruff Library in 2014, you can see a condensed version at the Oxford College Library starting Aug. 10. Among the items on display will be Heaney's writing desk, several editions of his poetry and other works, drafts of his writings that demonstrate his creative process, photographs, and correspondence between Heaney and fellow poet Ted Hughes. The Oxford College Library is located at 134 Few Circle, Oxford, Georgia, 30054. On Aug. 26, view "Zaytoun" (1982), a lively road movie exploring what happens when a teenage Palestinian refugee and an Israeli Air Force pilot leave Beirut together during the Lebanon War to return home. The free screening takes place at 7:30 p.m. in White Hall Room 208. Director Eran Riklis, one of Israel's most acclaimed filmmakers, will introduce the film, his first event on campus as Schwartz Foundation Artist in Residence. His residency, which continues through Sept. 11, includes presenting a total of four of his films; delivering three lectures on Israeli cinema; visiting classes and supervising a student film project. Check out the full schedule. 5. … And see movies off campus. Movies are a great way to beat the summer heat, but don't get burned on ticket prices. Before you purchase, check out discounts available to Emory employees. For AMC Theatres, your 35 percent discount brings the ticket price down to $8.25; locations include Phipps Plaza, North DeKalb Mall, Mansell Crossing, North Point Mall, Sugarloaf Mills, Stonecrest and Southlake, among others. For Regal Entertainment Group, 25 percent off makes your ticket price $8.60; options include the Hollywood 24, Atlantic Station and Tara Cinemas, to name a few. Tickets are available through Emory’s partnership with Sparkfly, which gives employees access to discounts on event and movie tickets, travel, restaurants and a variety of retail items. Sign in with your Emory network ID and password to see the full range of options. 6. Make art "In the Cards" at Woodruff Library. Once indispensable, library card catalogs became obsolete when information moved online. 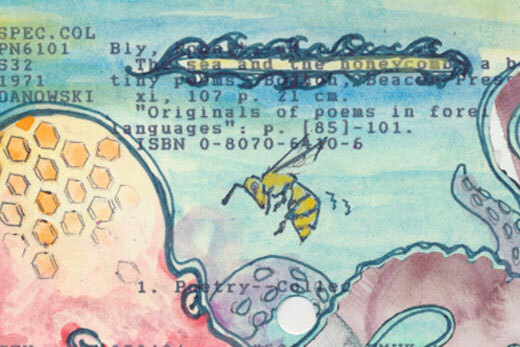 "It's in the Cards," an interactive, expanding art exhibit at the Robert W. Woodruff Library, features old library catalog cards that have been turned into art and poetry. Stop in, take home plain catalog cards, decorate them and return them to be displayed in the art exhibit. Need inspiration? Check out the "In the Cards" blog to see art created by other members of the Emory community. "It's in the Cards" is located on Level 2 of Woodruff Library; the free exhibit runs through Dec. 31. 7. Play tennis or other sports at the SAAC. In the summer, it's easy to think of the Student Activity & Academic Center on Clairmont Campus primarily as a place to swim, but don't forget the other amenities. SAAC also includes a tennis center with six hard courts and two soft courts; outdoor basketball and sand volleyball courts; indoor multi-sport courts for basketball, volleyball or badminton; a recreation field and a fitness center. Since your admission includes access to all of SAAC, you can cool off with a swim after you play. SAAC offers discounted annual and summer memberships for faculty and staff, as well as 14-visit guest passes that average to less than $9 per visit. The daily walk-up rate is $10. 8. Celebrate heirloom tomatoes at the Emory Farmers Market. The Heirloom Tomato Festival on Aug. 25 marks the return of Emory's weekly farmers market, which was only held monthly during the summer. Weather permitting, the market will be open from 11 a.m. until 3 p.m. Tuesdays in front of Cox Hall. Spend as much as you like, but there is plenty to purchase for $10 or less. 9. Learn how to stay motivated on your fitness journey. Emory offers many opportunities to stay fit, from faculty and staff memberships at campus fitness facilities to discounts at other gyms. You can also enjoy free places to walk and run like Lullwater Preserve and Hahn Woods, either on your own or through a walking group. But what if you are having trouble keeping your exercise momentum going? "Staying Motivated Along Your Fitness Journey" is the latest topic for a series of free wellness webinars from Emory’s Faculty Staff Assistance Program. Sign up to view on your computer either Tuesday, Aug. 11, or Tuesday, Aug. 18, from noon to 12:30 p.m.
10. Enjoy a quiet lunch or walk on the Quad. Emory's main Quadrangle is beautifully lush and green in the summer, and with most students away, it's much calmer than the hustle and bustle of the rest of the year. Pick up lunch from Cox Hall Food Court or the Dobbs Market (see summer dining hours), then stroll over to the Quad to enjoy the last days of relative quiet before students move back into their residence halls Aug. 22-23.